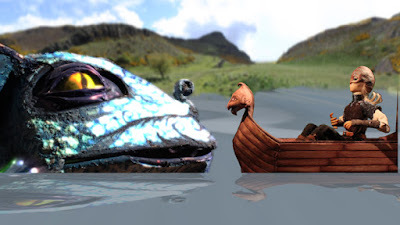 I am submitting for your consideration my 1,000-word picture book, A THOUSAND SLIMY THINGS AND I.
Thorvald, a young Orkadian shepherd who dreams of being a hero, goes off to fight an enormous sea monster that is threatening his home. Swallowed whole by the monster, he goes on an epic journey all the way to its “evil” heart. It is only there that he realises the heart holds no evil as the monster shares its tale of loneliness and misunderstanding with him. He finally sees that a true hero must have not only courage, but compassion as well and he vows to become the monster’s protector. I am a writer, illustrator and stop motion animator and the story is illustrated with staged photographs of miniature sets and characters created by me in my animation studio. This style of imagery will be appealing to children who enjoy stop motion films such as Aardman’s Wallace and Gromit shorts and Tim Burton’s Nightmare Before Christmas. Aardman Animations have released a series of books inspired by their film Shaun the Sheep, featuring the original characters and sets. The retelling of fairytales through the perspective of a traditional villain or monster is a popular trend in children’s literature and film as seen in such books as The True Story of the Three Little Pigs by Jon Scieszka and Lane Smith, The Wolf’s Story by Toby Forward and Izhar Cohen, and the recent film Maleficent. A THOUSAND SLIMY THINGS AND I focuses on the perspective of an under-explored mythic monster, and features an engaging, cinematic illustrative style using original characters and sets designed exclusively for the book. I studied life drawing at the National Academy of Design in New York and Traditional Animation at the School of Visual Arts, New York. My artwork has been exhibited in the National Academy Museum and at Cork Gallery in Lincoln Center, New York. The stop motion animated short films I have written, directed, and animated have screened at various international film festivals including the Edinburgh Fringe and have won awards from the British Library, the Arts Trust Scotland, and the UK Arts and Humanities Research Council. Thorvald had never seen anything outside of Orkney, where he was born, but he was sure no other place could be as beautiful. He never tired of climbing the cliffs around his village and looking at the sparkling sea, the heather-covered mountains, and the ancient ruins below. I'm intrigued. Please send the query and full manuscript in the body of the email to querymichelle @ mansionstreet.com. Also, if you have a dummy book, you can attach that as a pdf. Thanks for the request! I've just sent you the query, full text and pdf dummy. I look forward to hearing from you. I'd love to see more of this manuscript! Please send your query and full dummy to lara@andreabrownlit.com with "Requested" in the email subject line. Thank you! What a cool concept! And your art is awesome. I'd love to see the full manuscript and dummy. Please send them as attachments to LBiagi (at) jvnla (dot) com and include PBParty in the subject line and the query in the body of the email. Looking forward to reading!